I wore my white gogo boots to the office last week. With fishnet tights. Not sure why I ever bought these. Actually, I remember - they were an emergency impulse DSW buy after my ballet flats left my feet battered from a morning of walking in New York. No one need white boots. But I try to wear them occasionally to justify the purchase. Although if they cause my dismissal at work, that won't justify much. It's cool - the rest of my outfit was conservative. A turtleneck makes everything ok. Right. Right? Right?? I work at a design firm, so I feel there should be some creative license to the dress code. OK, the fishnet tights are a bit much. They are tasteful fishnets... I dare say, however, that some people at work seemed to like the outfit - it reminded them of growing up in the 60s. 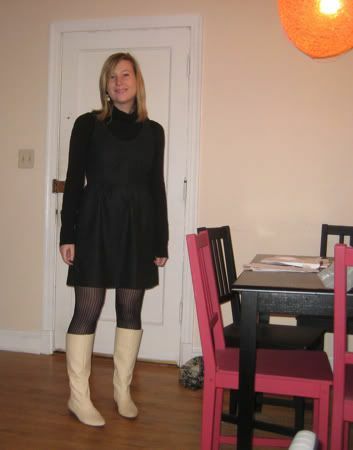 My friend Prudence had the best reaction to my boots. I walked by her in the kitchen as she was drinking a glass of water - she looked down at the gogo boots and almost did a spit-take. That was a honest assessment. Leave me a comment and let me know if you have ideas on how to wear white flat boots. Also, should I do more fashion-blogger-esque outfit posts? Not because I think that I am a model. I don't at all. Just because most of the blogs I read are fashion-related and I think it would be fun to throw my hat (or white boots) into the ring. Posted in Style and tagged with Fashion, Shoes. January 18, 2011 by Adele Chapin.